Judicial Clerk for Judge Nicholas Stroumtsos, Superior Court of Essex County. 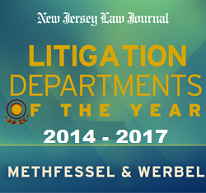 Ms. Stanziale joined Methfessel & Werbel upon completion of her judicial clerkship. Since then, she has handled both coverage and liability cases. Initially, as a first-year associate, she worked under the direction of John Methfessel, Jr., in the firm’s liability department where she learned the intricacies of handling defense files and where she gained trial experience appearing on Special Civil Court matters. Her very first Superior Court trial resulted in a no cause on behalf of a property owner who was sued for negligence for failing to maintain his property. For the next three years, Ms. Stanziale handled both automobile and premises liability files from the filing of an Answer to jury verdict. During that time, she lectured on premises liability at a firm-sponsored seminar and was selected as a member of the Inns of Court of Essex County. Thereafter, her area of concentration was pre-suit investigation of fraud, auto theft, property, and PIP cases. Her work on those types of cases ranged from the opening of files and the taking of Examinations under Oath to the filing and arguing of Orders to Show Cause and Declaratory Judgment actions. In that capacity, she was successful in having 6-figure claims dismissed and policies declared void ab initio for material misrepresentation and fraud. She has worked with the Office of Insurance Fraud Prosecutor to bring insurance fraud violators to justice. Currently, Ms. Stanziale is a member of the firm’s property team under the direction of Marc Dembling. There, she handles the defense of both first and third-party claims from institution of suit, including the drafting of declaratory judgment complaints, to resolution including mediation and appeals to the Appellate Division where she has appeared for oral argument. Her appellate arguments have resulted in both the reversal of a trial court’s determination of coverage and the affirming of a trial court’s declaration of no coverage on all types of cases including UM/UIM, property, and PIP. She continues to handle PIP claims as well and appears on a regular basis in alternate dispute forums such as Forthright and Arb Forums where her submissions and oral argument have led to the dismissal of claims in excess of $100,000. Ms. Stanziale is most comfortable “on her feet” where she enjoys applying the facts of each individual case to the relevant law. Her ability to distinguish case law and interpret policy language has helped her to frequently succeed on motions for summary judgment and motions in limine. In addition to her work in the insurance industry, she welcomes pro bono cases where she has expanded her defense litigation experience to the areas of domestic violence and DWI. Having been appointed by the Supreme Court of New Jersey, Gina serves as a member of the District Ethics Committee for Passaic County (DEC XI).